This is an important piece for most Avarice decks that are slower. This gives both a way of getting rid of an important threat for a small amount of time but also a blocker during that time. 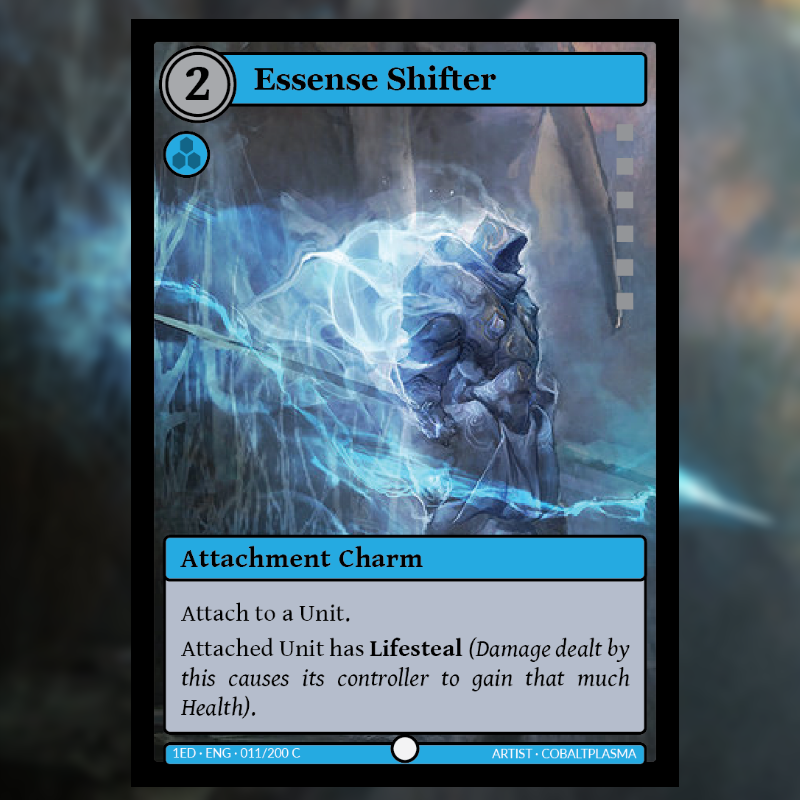 Against most Penance and Decay (and to a lesser extent, Fighters) will make short work of the Unit but against other Attributes, this will prove to be a very reliable removal spell. Temporary Card art is from Lyraina on deviantart and their own website. Today’s card is on that fits into the Elves archetype. Within Horizon, Elves fall mostly in the Unity and Wrath Attributes and many in Fighters or Mage classes. This tend to be a very aggressive archetype that wins usually through the shear force of numbers or by punching through with a card like Wild Spirit. Unlike the Capri which also play a numbers game but tend to lean more towards Vigor as a second attribute, Elves tend to a harder time holding on to their Units, with them either having low Def or sacrificing themselves rather quickly. 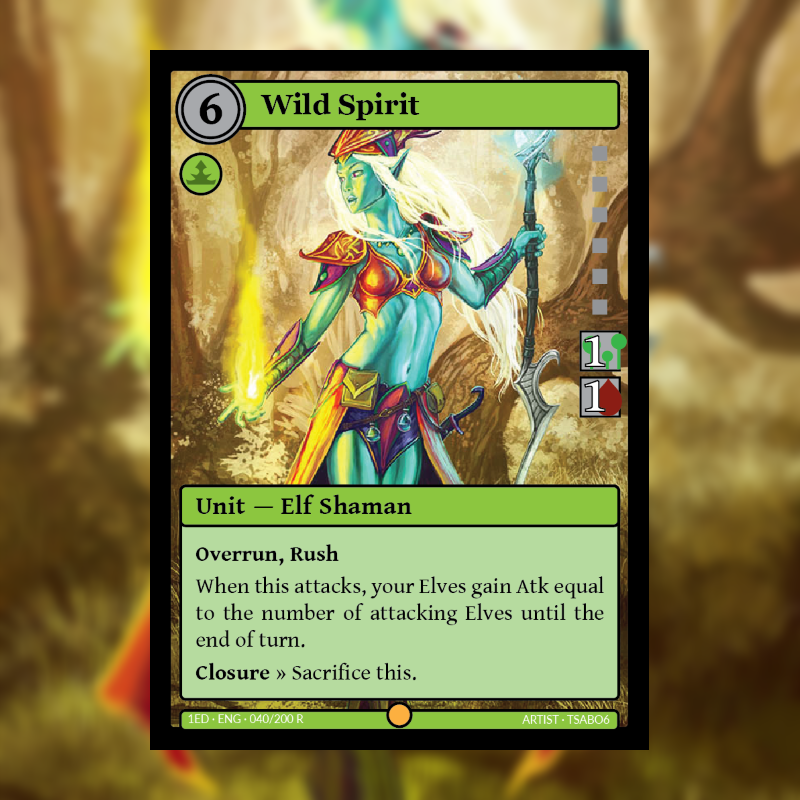 Temporary Art for Wild Spirit is from Tsabo6 from DeviantArt. Part of the Health Gain matters Archetype, Umber Knight would be a key member of that. With an continuous health gain engine, Umber Knight can get very big very quickly. Life Breather is a good pairing with this as well as Ziro Read if you can manage it (would require a Hero that has both Penance and Unity attributes) as they can gain Health continuously. If you enjoy Horizon or our work, think about supporting us on Patreon by clicking the icon in the side bar or by going to https://patreon.com/horizoncardgame. 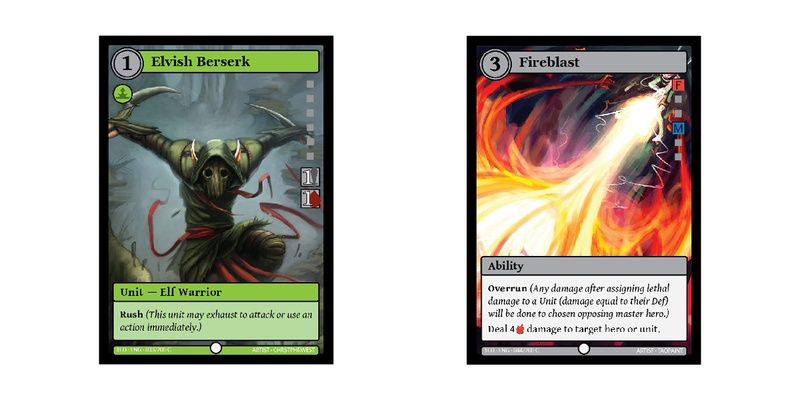 The temporary card art is from ConorBurkeArt on DeviantArt and Instagram. Card of the Day Triple Feature: Ziro Read, Shield Wall, and Duel! Sorry for missing yesterday but we can have a Triple Feature for Friday to make up for it. Ziro Read is the Penance starter deck Hero and is ultimately pretty strong from his main action (note: Lifesteal has had a name change to Lifeleech). The Bruiser playstyle is typically damage is alright as long as you are achieving something out of it and that’s basically what Ziro embodies. Ziro’s temporary art is from ConorBurkeart again from deviantart. Shield Wall is the first instance we have Armor. Armor works as a way of reducing incoming damage by the amount after the trait. In this case it is dependent on the Relic that you target with it. This is also the first time we see there is an action on a card that can be taken only if this card is in your hand. Shield Wall comes from a cycle of cards that are either used for their action or can contribute 2 aether every time it is exhausted. Shield Wall’s temporary art is from WandererLink on deviantart. Duel! is one of my favorite cards. It was inspired by Legion Commander’s Ultimate Duel! from Dota. Continuous fighting until one of the two are victorious. Duel!’s temporary art is from Wlop on deviantart. Author horizonAdminPosted on July 27, 2018 September 6, 2018 Categories Card of the DayLeave a comment on Card of the Day Triple Feature: Ziro Read, Shield Wall, and Duel! Today we have our first Unique card. Unique is a card supertype that has the mechanics that a player can control only one unique card with the same name at the time. If a new one with the same name would be played, that player chooses which one to sacrifice. Garmond is also a particularly good card boss unit for most Penance based decks that have a decent amount of unit production. I mean you don’t require a ton but if you have at least one unit at the end of every one of your turns, you can almost guarantee Garmond returning to your hand. I believe these are the first time having the actions Arrive and Closure on a card before. Arrive is an action that is activated when that card enters the field. Closure will trigger at the end of turn. Their opposites are Depart (or Gravecall, depending out how you look at it) and Advent. I am sure we will see cards with those actions some time soon. Garmond, the Unsatisfied’s temporary card art was done by the wonderful artist “Conor Burkeart” from deviantart. Click here to head on over and give them some praise. Today we have our first “Attributes Matter” card. 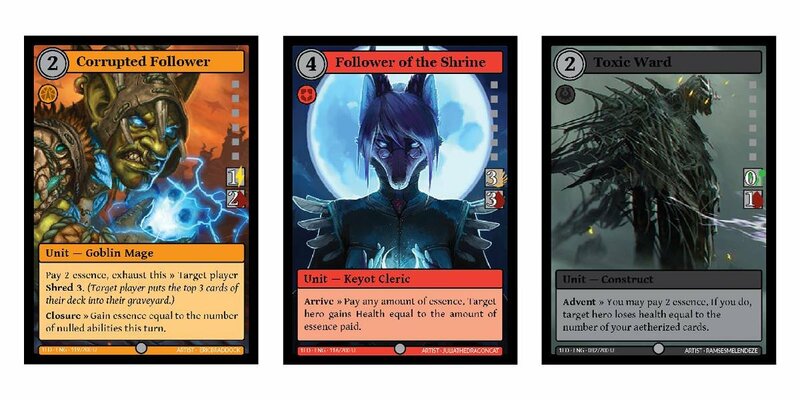 These are part of a small series for each of the Attributes (the symbols on the left side of the card under the cost and name; Red = Vigor, Blue = Unity, Green = Wrath, Black = Decay, Purple = Penance, Orange = Avarice). 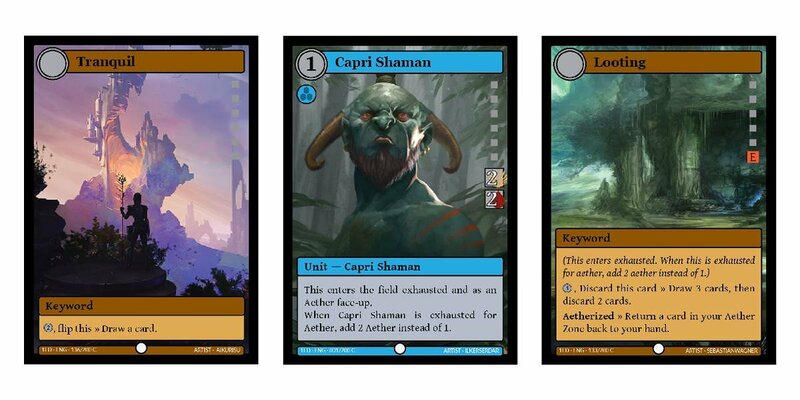 They are supposed to encourage Mono-Attribute decks and how they could have an advantage over decks that would use multiple Attributes. 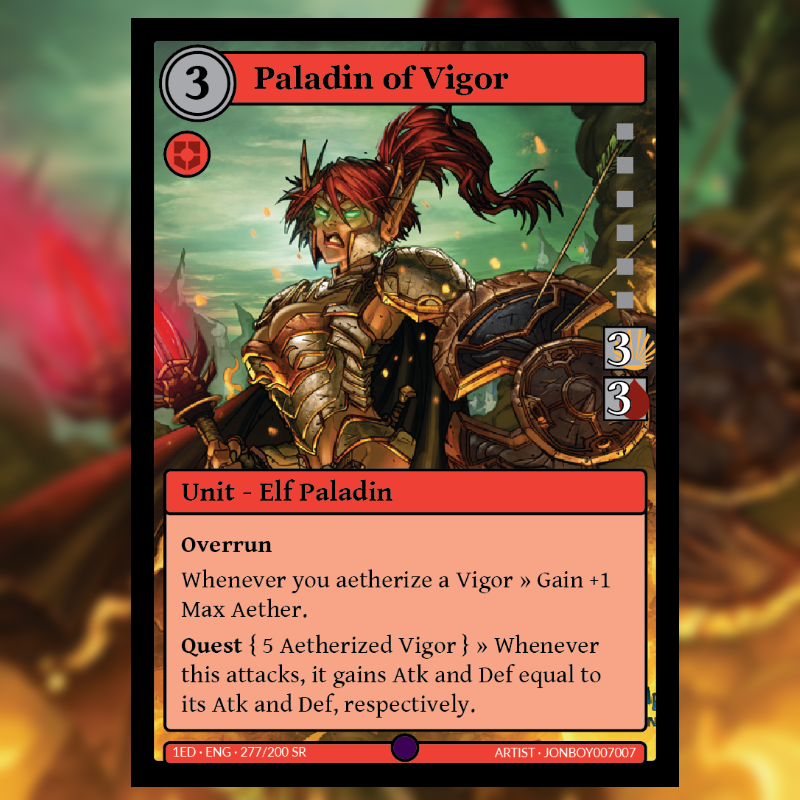 Her second action is every time you aetherize a Vigor (a card with Vigor as an attribute), you gain +1 Max Aether permanently. This will not give you the temporary Aether to use for the turn, but on the start of your turn you will have additional Aether. Lastly, if you have Aetherized 5 Vigor, then the rampage will begin. She will gain more and more stats as she attacks, combined with Overrun, she will end the game rather quickly. The temporary card art is from Jonboy007007. You can head on over to his deviantart page and say thanks. Today’s card is the first charm show. Charms are cards that stay in play after being played (Objects in game lingo). However this one also attaches to a unit and will leave when the unit leaves. This one happens to give the attached unit Lifesteal. This pairs nicely with a strong Unity unit or something similar. The first Quest card we have. 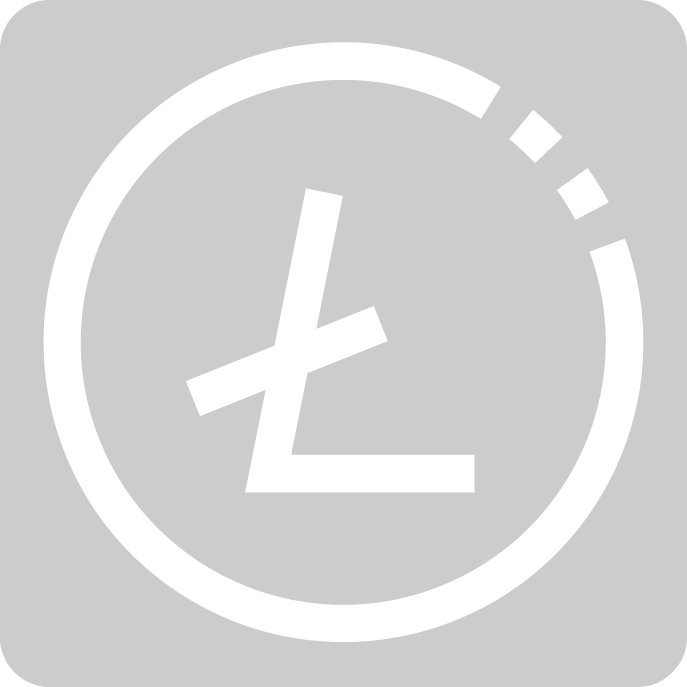 A Quest is an action on a card that will activate automatically if the requirements are fulfilled. These could be specific cards on the battlefield, a number of cards in your discard, or having less than 5 health. And many more. 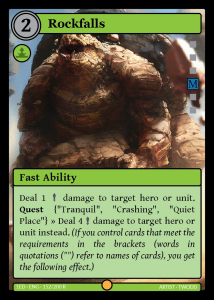 In this instance, we would need Tranquil, Crashing, and Quiet Place to activate the quest so only something dedicated to getting keywords would really be worth it to run this card. However 2 resources for 4 damage anywhere at Fast speed is pretty good at the end of the day too. 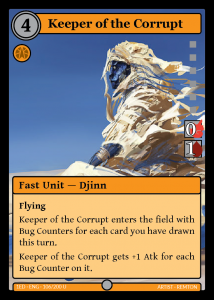 Keeper of the Corrupt enters the field with Bug Counters for each card you have drawn this turn. Keeper of the Corrupt gets +1 Atk for each Bug Counter on it. A fantastic pay off card for “drawing cards matters” decks or a deck that will draw a burst of cards in one go. In addition, this is a Fast Unit, such that if one would pair this up with a removed Emerging Ideas or Resources from Sacrifice, then this could be fairly formidable as a general unit.